The introduction of competition in the generation and retail of electricity has changed the ways in which power systems function. The design and operation of successful competitive electricity markets requires a sound understanding of both power systems engineering and underlying economic principles of a competitive market. This extensively revised and updated edition of the classic text on power system economics explains the basic economic principles underpinning the design, operation, and planning of modern power systems in a competitive environment. It also discusses the economics of renewable energy sources in electricity markets, the provision of incentives, and the cost of integrating renewables in the grid. 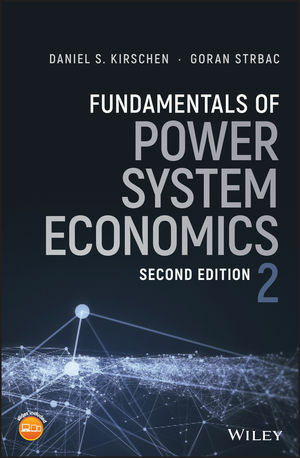 Fundamentals of Power System Economics, Second Edition looks at the fundamental concepts of microeconomics, organization, and operation of electricity markets, market participants strategies, operational reliability and ancillary services, network congestion and related LMP and transmission rights, transmission investment, and generation investment. It also expands the chapter on generation investmentsdiscussing capacity mechanisms in more detail and the need for capacity markets aimed at ensuring that enough generation capacity is available when renewable energy sources are not producing due to lack of wind or sun. Fundamentals of Power System Economics, Second Edition is essential reading for graduate and undergraduate students, professors, practicing engineers, as well as all others who want to understand how economics and power system engineering interact. DANIEL S. KIRSCHEN, PHD, is the Donald W. and Ruth Mary Close Professor of Electrical Engineering at the University of Washington, Seattle, USA. GORAN STRBAC, PHD, is a Professor of Energy Systems at Imperial College London, UK. He is also a member of the Steering Committee of the SmartGrids European Technology Platform, co-chair of EU WG on Sustainable Districts and Built Environment of Smart Cities, and Director of the UK Centre for Grid Scale Energy Storage.